Get excited! Star Wars Resistance will be back this fall. We’re Star Wars fans and looking to the future is one of the things Star Wars fans do best. With Lucasfilm’s latest animated series, Star Wars Resistance, having recently wrapped up its first season, we felt it was time to think about what we’d love to see the show accomplish when it returns for season two this fall on the Disney Channel. Poe and the Resistance love looking at maps. Not directly, of course. We still want Resistance to be about the characters on Resistance. But, just by virtue of the timeline of the show versus the timeline of the movies, it’s almost guaranteed that when Resistance returns for season two, it will be the first Star Wars story set after the events of The Last Jedi. So embrace that! Make the story about the fact that most of the Resistance has been wiped out, about the few survivors on the run, and give fans a little bit of a hint of what happened in the universe after the death of Luke Skywalker (but before the opening crawl to Episode IX). I mean, it’s called “Resistance” after all. The rebirth of the actual Resistance seems like a worthy topic. Plus, you’ve gotta bring back Poe and Leia. You just gotta. Season two will have more Aces. When Resistance was first announced, we all expected it to be a show about hot shot pilots. And it was, tangentially. Kaz was a great pilot and he flew with an even better pilot in Poe. There were one or two episodes with racing, but the biggest and best pilots, the Aces, didn’t have much to do. In season two we hope not only to see the pilots do more action-wise, but integrate more with the story plot-wise. Thankfully, Ridge confirmed that this would be happening. “[The Aces] definitely will play a bigger part in season two,” he said. Well, with season two we don’t want to see Tam come back to Team Fireball. Let’s see her get deeper and deeper into the First Order. Maybe she can kind of go the Han Solo route, a character that always wanted to be a pilot and joined the bad guys to do that. Unlike Solo though, Tam should succeed and excel. And having a rival that we know and care of going up against Kaz and her old friends would give the show a whole new level of emotional impact. Don’t forget, Doza has some Imperial secrets. Look, some of these go without saying. Season one was about setting the table and season two will be about going a little deeper. But the first season did a great job of teasing us about the pasts of characters like Yeager and Doza. We know almost nothing about Neeku and his people and there are some loose ends in terms of Kel and Eila. Basically, while it’s obvious the story will move forward, we just hope it does so in a way that lets us understand these characters more, and therefore care more about them. Flix and Orka can’t be too happy about all this. Season one ended with the Colossus uprooting itself from the planet and jumping into deep space. That’s a great strategy for getting rid of the First Order, but less of a good thing for the normal people on the Colossus who are just trying to make a living. How would you feel if your hometown just up and moved somewhere where people couldn’t find you? We’d love to see not just a little fallout from this, but a lot. Kaz and Team Fireball should ostensibly become villains to the people of the Colossus. It could create a tension beyond the real problems, like the First Order, that would raise the stress levels for everyone involved. Could we see Batuu next year? It would fit! Since it’s all but confirmed that the Resistance and First Order have some kind of conflict between Episodes VIII and IX on the planet of Batuu, maybe the Resistance team would have some reason to arrive on the planet being built in the Disney parks. What happens then? I don’t know. I just hope to see an area of a theme park animated on television to make the whole reality of going there that much cooler and more tangible. Leia’s family history never came up on Resistance. We hope it does. The team behind Resistance prides themselves on making a Star Wars show without Jedi, lightsabers, or the Force. But, as we know, the Force is everywhere. And with Luke Skywalker’s sacrifice being the spark that’ll light the fire for the Resistance, it would make a lot of sense for there to be some acknowledgment of these grand myths on the show, even if they aren’t the focus. It’s not just the DNA of the franchise itself, it’s an essential element to the Resistance’s core beliefs. If Kaz and his friends are now part of the Resistance, they should at least be talking about these things. 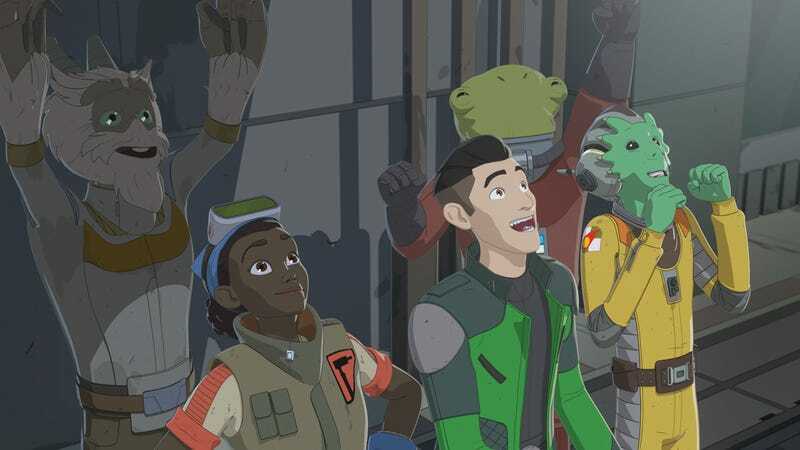 Star Wars Resistance comes back for season two in the fall, and we expect to learn more about it next month at Star Wars Celebration.